Thickening of the mouth of a tendon tunnel leads to roughness of the tendon surface, and the tendon then catches in the tunnel mouth. People with insulin-dependent diabetes are especially prone to triggering, but most trigger digits occur in people without diabetes. Triggering occasionally appears to start after an injury such as a knock on the hand. There is little evidence that it is caused by work activities, but the pain can certainly be aggravated by hand use at work, at home, in the garden or at sport. Triggering is sometimes due to tendon nodules in people known to have rheumatoid arthritis. It is not caused byosteoarthritis. Pain at the site of triggering in the palm (fingers) or on the palm surface of the thumb at the middle joint, usually in a person over the age of 40. Tenderness if you press on the site of pain. Clicking of the digit during movement, or locking in a bent position, often worse on waking in the morning. The digit may need to be straightened with pressure from the opposite hand. Stiffness, especially in trigger thumb where movement at the end joint is reduced. Using a small splint to hold the finger or thumb straight at night. A splint can be fitted by a hand therapist, but even a lollipop stick held on with tape can be used as a temporary splint. 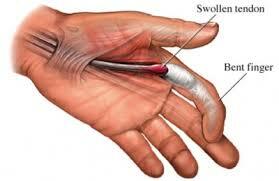 Holding the finger straight at night keeps the roughened segment of tendon in the tunnel and makes it smoother. Steroid injection relieves the pain and triggering in about 70% of cases, but the success rate is lower in people with diabetes. The risks of injection are small, but it very occasionally causes some thinning or colour change in the skin at the site of injection. Improvement may occur within a few days of injection, but may take several weeks. A second injection is sometimes helpful, but surgery may be needed if triggering persists. Percutaneous trigger finger release with a needle. Some surgeons prefer to release the tight mouth of the tunnel using a needle inserted under a local anaesthetic injection, but others feel that open surgery is more effective. The needle method is not suitable for all cases and all digits. 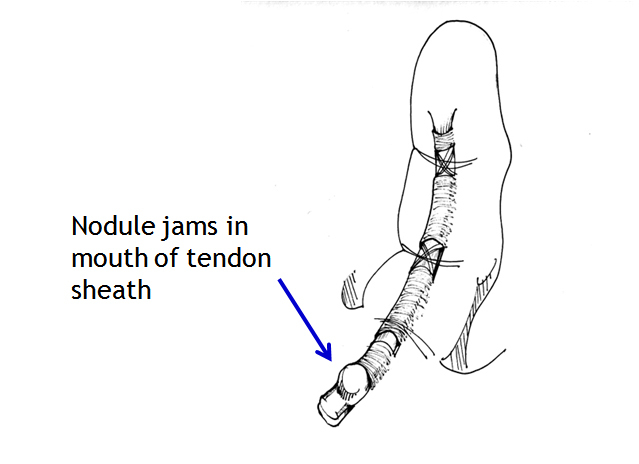 Surgical decompression of the tendon tunnel. The anaesthetic may be local (injected under the skin at the site of operation) regional (injected in the armpit to numb the entire arm) or a general anaesthetic. Through a small incision, and protecting nerves that lie near the tunnel, the surgeon widens the mouth of the tendon tunnel by slitting its roof. The wound will require a small dressing for 10-14 days, but light use of the hand is possible from the day of surgery and active use of the digit will aid the recovery of movement. Pain relief is usually rapid. Although the scar may be red and tender for several weeks, it is seldom troublesome in the longer term. Recurrence of triggering after surgery is uncommon.